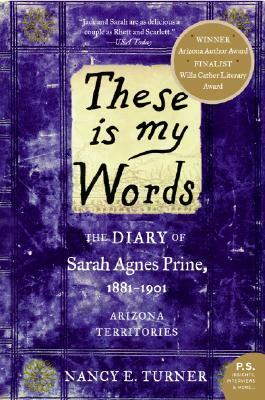 A moving, exciting, and heartfelt American saga inspired by the author's own family memoirs, these words belong to Sarah Prine, a woman of spirit and fire who forges a full and remarkable existence in a harsh, unfamiliar frontier. Scrupulously recording her steps down the path Providence has set her upon—from child to determined young adult to loving mother—she shares the turbulent events, both joyous and tragic, that molded her, and recalls the enduring love with cavalry officer Captain Jack Elliot that gave her strength and purpose. Rich in authentic everyday details and alive with truly unforgettable characters, These Is My Words brilliantly brings a vanished world to breathtaking life again. Nancy E. Turner is the author of several works of fiction, including The Water and the Blood and Sarah's Quilt. She has been a seam snipper in a clothing factory, a church piano player, a paleontologist's aide, and an executive secretary. She lives in Tucson, Arizona, with her husband and two children. This is a beautifully written book that quickly captures readers’ attention and holds it tightly and emotionally until the end.